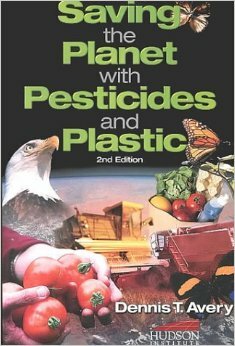 As an undergraduate, I was tasked with a reading from the provocatively titled book Saving the Planet With Pesticides and Plastics by Dennis Avery. Despite my farm upbringing, I was solidly convinced that pesticides were a “necessary evil”. No question – this was an established, irrefutable fact. I delved into the chapters with a great degree of trepidation. Upon further review, it seemed that pesticides were not evil incarnate after all. A steady deluge of diseases and pests are all unapologetically vying for the farmer’s lifeblood – his or her crops. Agricultural protectants are a vital tool in the farmer’s repertoire to ensure consistent yields and profitability. Most important was the fact that pesticides acted as a hedge against a not so obvious externality – the loss of biodiversity. Crop losses attributed to pests and diseases are often so severe without pesticides that farmers are compelled to clear an ever-larger footprint of pristine forests to compensate. This (very rational) thesis was a cognitive epiphany. I contacted Dennis and inquired about an internship at the Center for Global Food Issues (CGFI), outside of Staunton. Dennis explained that “we’ve never had an intern before, but are definitely willing to take one on”. After verifying my credentials, I got the greenlight – I packed up and embarked on my first trip to the Shenandoah Valley. Once there, I was welcomed with open arms by Dennis’ family and given intensive op-ed writing training. I also took the lead on a white paper describing the impacts of production practices on avian populations for the Swedish Graingrowers Association. And that brings me full circle back to Virginia and VALOR. I was pleased to see Dennis speak at an environmental issues panel at our most recent Valley seminar. Cognitive dissonance still persists in the public eye. Agriculture is a popular focal point for hyperbole and outright misinformation. No matter how well intentioned (or malicious), well-heeled activists can successfully drive the dialog. This was one of my prime motivations for applying to VALOR – there needs to be an alternative voice in the discourse. Media is just the platform to do so. Our recent training at WVPT with Amy Roscher was especially informative. And while it’s often framed as giving the proper “spin” on an issue, it’s more nuanced than that – it’s simply telling your story as a farmer. And as a farmer, you have eminent credibility. Previous postThe Shenandoah Valley Gets It!